As a user, your perspective on Flash will change if you install Flash-blocker installed on your browser. If you’re using Firefox, download Flashblock. 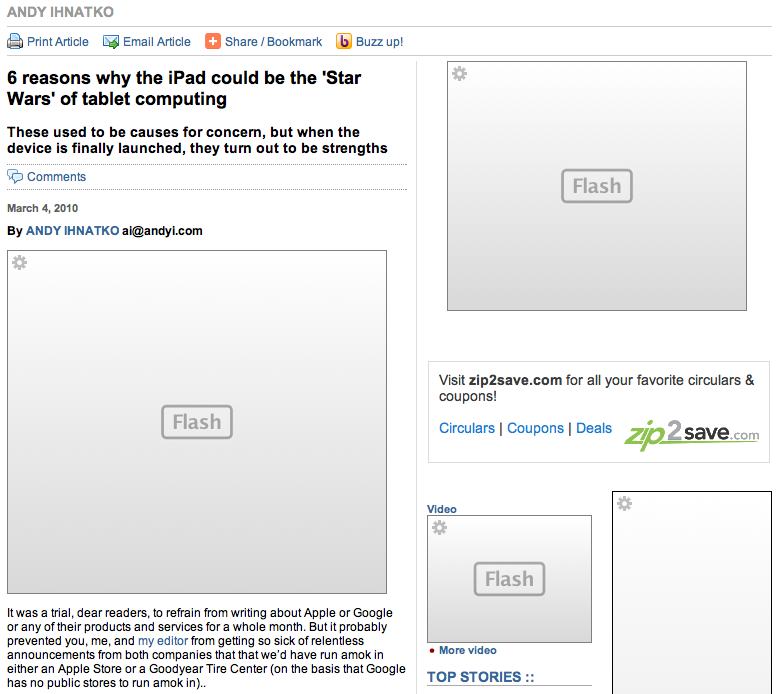 If you’re using Safari, get ClickToFlash. If you’re using Internet Explorer or Chrome ... download Firefox or Safari. 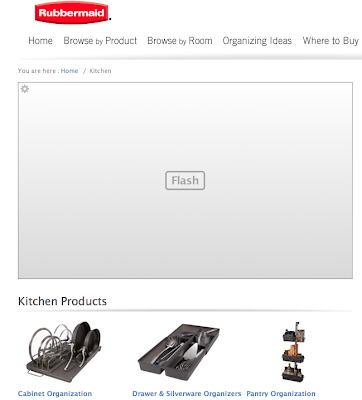 With the plugin running, a placeholder appears where any Flash content should have loaded. If you really want to see it, give the placeholder a click, and the missing content will load and run. Now? My browsers almost never lock up. My PCs and Macs spend far less time whistling nonchalantly behind a Spinning Cursor Of Infinite Impatience. Well, sure enough. I use Safari as my primary browser, so I installed ClickToFlash. And now pages with Flash load much more quickly - and yes, my browser is more stable. And unless I specifically want to watch a video (on YouTube, for example), I find I rarely click to load the Flash content. The Rubbermaid site, for example, works just fine without the Flash. Windows/IE7 only: Nothing's better than heading to a web page to find some information and being greeted with a slow-loading, over-the-top Flash intro, right? For distracting, crash-causing, or otherwise troublesome animated pages, Toggle Flash, a free Internet Explorer 7 add-on, soothes the pain pretty quickly. Want to see something funny? 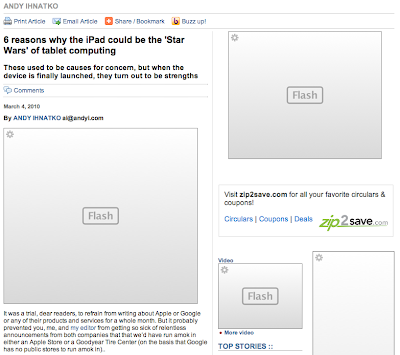 With ClickToFlash installed, follow the link to Andy's excellent article and you'll see something like the site above. Lots of Flash, successfully blocked. I haven't tried either Flashblock or Toggle Flash, so I can't vouch for them from personal experience. If anyone else has, please add a comment and tell us how it worked for you. 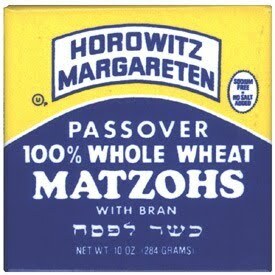 Three are my favorite Passover-themed magnets. 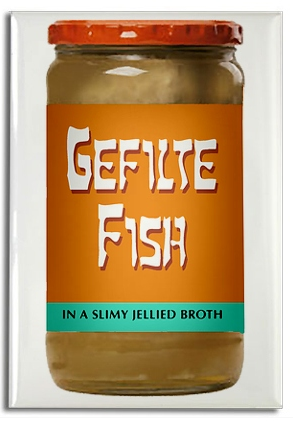 On a whim, I went looking for Passover magnets - and was surprised by the number of nice choices. This is the first one I found. As someone who has never become a fan of gefilte fish, this magnet made me smile. But my absolute favorite is this rendering of the 10 plagues, by wonkymonkey. 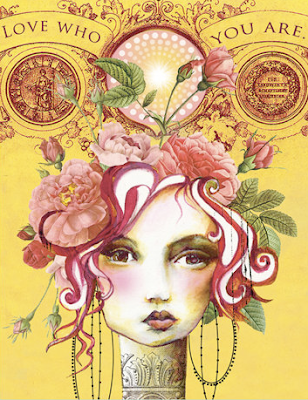 Update on March 29, 2010: I should also do a shout-out to Kyle Thiessen, who did the original artwork. I've read over 100 organizing-related books, so in most cases I don't expect to learn much new when I pick up another one. If I get one new idea, or a few good turns of phrase, or some good stories to illustrate a point, I'm pretty happy. How to Cheat at Organizing, which I learned about from Naomi Seldin of Simpler Living, delivered all of that. The book is filled with solid organizing advice - but I'll share some of the things that really jumped out at me. For example, while I'm not usually a fan of cutesy acronyms, I did like HIRE: "If a task is Hard, Important, Rarely done, and Elaborate, pay a pro." That doesn't mean you might not also get help for other things, such as house cleaning and yard work - if such help fits your budget and helps you attend to your priorities. It just means that things that fit the HIRE criteria are the most important ones to get help with. And I also loved UGH: Unwanted Gift Headache. Here's author Jeff Bredenberg's advice on a number of topics. 1. Owning movies: "Minute by minute, it's getting easier to get quick access to any movie ever made. ... Rest assured that for the rest of your life, Casablanca with be at your fingertips. You don't have to own it, and you don't have to fret about the fact that the format you own it on will be obsolete within a few years." 2. Coupons: "Round up all of your coupons, along with your foot-thick coupon-organizing accordion envelope, and drop it all in the recycling bin. ... I'm all in favor of saving money. But is couponing really worth the effort? Only a small percentage of coupon fans manage to make the system pay off big time, and doing so requires hours of effort each week. If you put those hours instead into working, or into interacting with your family, the rewards would be much greater. ... For most of us, couponing is actually the worst-paying part-time job in the world." But Bredenberg then goes on to provide advice on how to best clip, organize, and use coupons if you really do want to use them - starting with "make sure you need it." He points out that "coupon users spend an average of 8 percent more in supermarkets than nonusers." 3. All that information piling up in your file cabinet: "Janet Luhrs, author of The Simple Living Guide, loves to travel. ... she and a friend once decided to go on a houseboat vacation together, and made their arrangement over the Internet. Upon her return from the trip, Luhrs discovered to her dismay that she had a complete hard-copy file devoted to houseboat vacations - which she had forgotten about and never consulted. After years of careful filing, she never though to go to her own cabinet for the information. "Lesson learned: To heck with paper files. That massive electronic filing cabinet called the Internet often provides all the research you need." There's plenty more; if you read this book, you'll find your own gems. 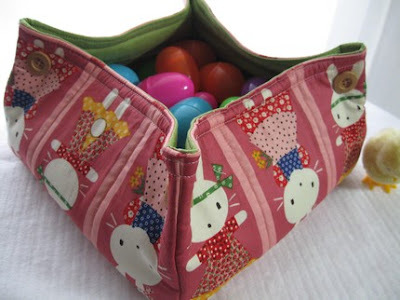 If you're going to get an Easter basket, why not get one that really pleases you - and one that has storage potential beyond one day's eggs? The one above comes from A.J. McCray of Baskauta. 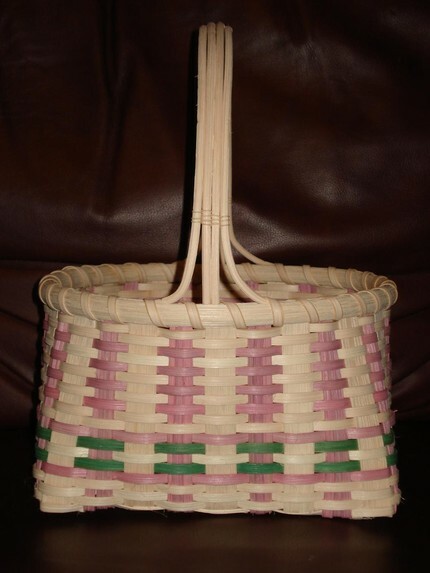 But you don't need to stick to woven baskets. 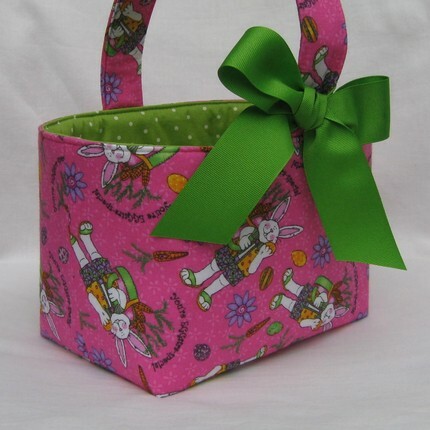 For example, you might like these felt bunny baskets. Update on April 20, 2011: The site selling these has shut down. 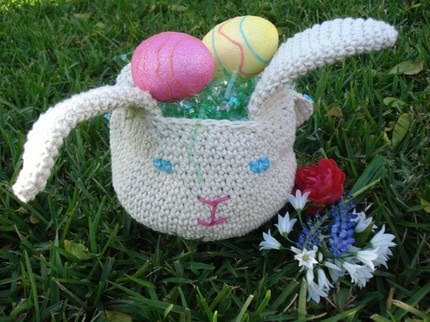 This cute little basket from Handmade Home Care was hand-crocheted. Baffin Bags has a number of fabric Easter baskets; this is my favorite. And staying with cool prints for a minute, here's a basket from Savaria. That's Sandra, born in Bavaria, and currently living in South Korea; her husband is in the U.S. military. 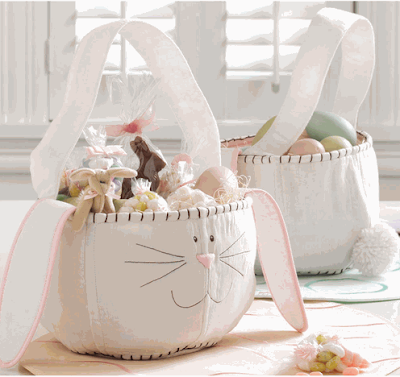 This bunny Easter basket comes with six cracked-egg candles. (I wish you could buy the basket without the candles, but it seems to be a package deal.) Update on April 20, 2011: This year the basket seems to be selling without the candles. 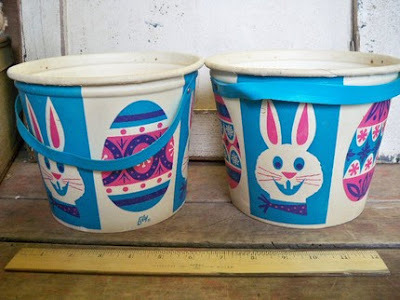 You could also go the bucket route. Whendi's Bears is selling these vintage Easter buckets. Wendy (who spells her name differently than the name of her shop) says they are made of a heavy cardboard-type material. 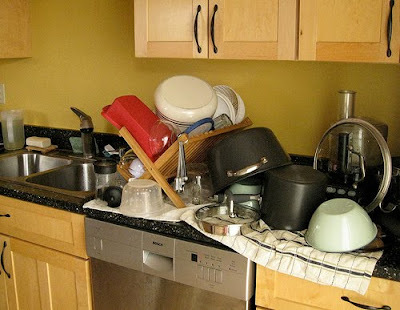 I just realized that even though I love the dish drying rack that I have -- it is a trap: my counter looks totally cluttered because things tend to collect there, and the rack itself collects debris and should be cleaned more often than it gets cleaned. So -- I am trying an experiment: I am retiring it. With the intent of pulling it out when cleaning up from a large party or something... but it may go permanently... we'll see. Julie, let's look at some possible answers from the simplest to most complex. 1. Just use a towel. I know plenty of people - including myself and my stepmom, Wendy - who don't use a rack. I actually have fond memories of cleaning up after parties with Dad and Wendy: Motown music playing, towels on the counter for the things that didn't go in the dishwasher, Wendy washing, Dad and me drying. At home, when I'm just washing a few dishes for myself, I don't even bother with the towel. I just put the dishes on the counter, dry them, and wipe the counter dry. 2. Get a drying tray or mat. - The DryMate Kitchen Dry Mat shown above. 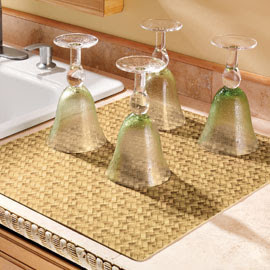 - The silicone drying mats from Oxo. - The Original Dish Drying Mat, from Garden Botanika. - The brightly-colored glass drying mats from Make My Day in Australia (small and large). 3. Get a folding or collapsible rack. There are a lot of options here, too. 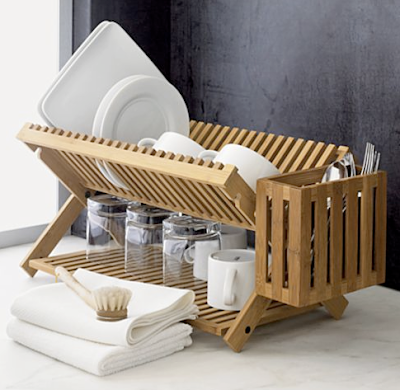 A basic folding bamboo dish rack can be found many places, but if you're willing to spend more, you can get this lovely dish rack from Crate and Barrel. It folds entirely flat, too. 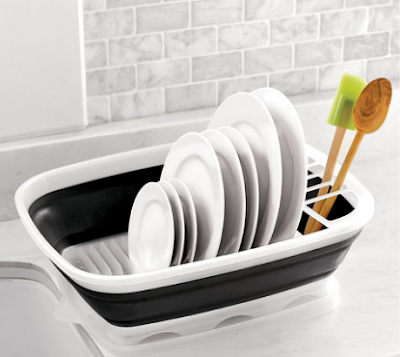 Update on June 28, 2011: Crate and Barrel no longer carries this dish rack. Another interesting collapsible is the high&dry. 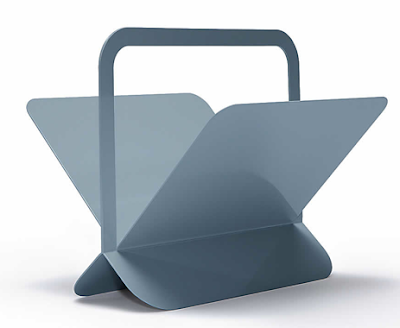 Progressive International also has an interesting collapsible dish rack, sold by Sur La Table and others. There's an over-the-sink version, too. 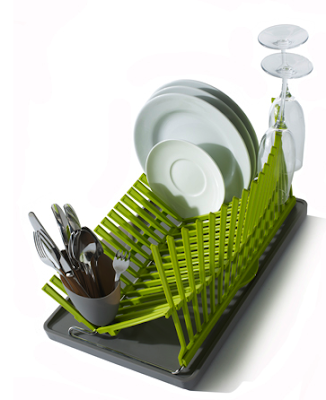 And here's another folding dish rack. 4. 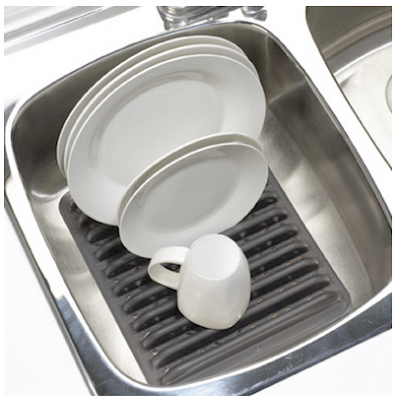 Get a in-sink dish rack. 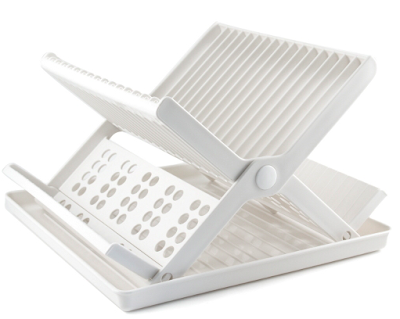 Some of these, like the sink dish rack from Umbra, wouldn't take much room when removed. 5. Get an astiankuivauskaappi - a Finnish dish-drying cabinet. OK, this one is a bit hard to do in the U.S., and it won't work for every kitchen. But the idea is very cool. You can see more photos here and here; read about the dish draining closet on Wikipedia, and even become a fan of the astiankuivauskaappi on Facebook. You can also see the same type of arrangement in Italy. Well, to be more accurate, I can't resist writing about a good magnet. And here's the first like to see amazing magnet I'd like to share. Not your style? I've got more to show you. 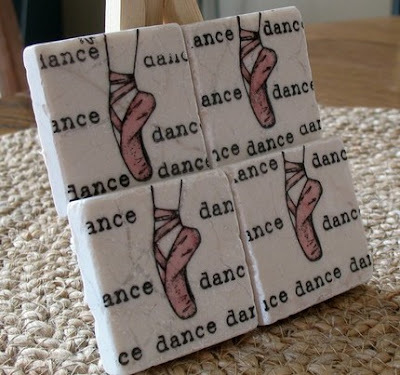 Here's one of the many tile magnet sets from Ellie at My Little Chickadee Creations. 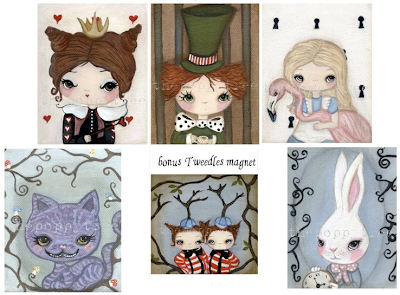 Or how about some Alice in Wonderland magnets? 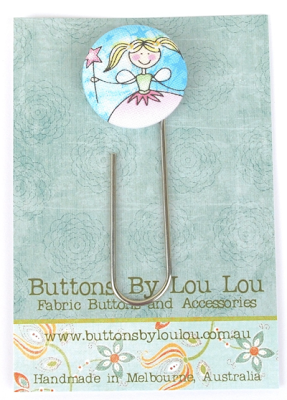 This set is just one of the magnet selections from The Poppy Tree. 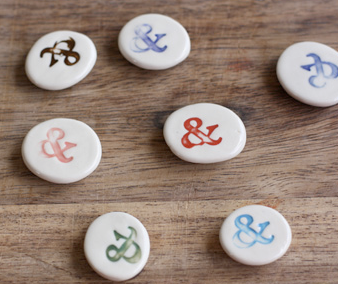 Update on Sept. 6, 2010: It seems this Etsy shop no longer sells magnets. Today, I didn't need my backups. I was lucky. Last night, I took my MacBook over to Judy Shintani's studio for her Women's Do Your Own Thing Night. I pressed the power button, and my MacBook powered on - but the screen was blank. I took it home, hooked it up to my external monitor - again, nothing. So I pulled out my iPhone, made an appointment at the Apple Store, and tried not to lose too much sleep. And today I got a new logic board installed - under warranty. But I'm lucky that the logic board was my problem, and not my hard drive, because my last backup was about a week old. OK, losing a week of data wouldn't be too horrible - but it wouldn't have been fun, either. So the first thing I did when I returned home was to do a new backup, and recommit to doing those backups every night. Given my experience, I smiled when the following item popped up in my Google Reader today: Yes. Another Backup Lecture. - If it’s not automated, it’s not a real backup. - If it’s not redundant, it’s not a real backup. 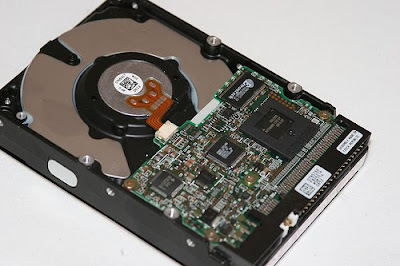 - If it’s not regularly rotated off-site, it’s not a real backup. Given that guidance, I'm looking at making my reasonably-good backup strategy even better, since I fail on the "automated" part. Lots of things can go wrong with a computer. Here's John Locke's story: "Last week, my laptop died a sudden spectacular death-by-drowning, as a full cup of coffee poured into its keyboard." You might get some warning signs that your hard drive is about to fail - but not always, even if you don't spill coffee on your machine. Want some help coming up with a backup strategy? If you're on a Mac, you might read The No-worry Backup Plan for a good overview of your options. The question of "what's the best way to store my knives?" comes up whenever I teach my kitchen organizing class, and I never have an answer that I like. The magnets are easiest access, but can be a problem for pet/kid safety (how are they in earthquakes? ), and feng shui says they're an absolute no-no. I've been told that the blocks dull the knives (and they take up counter space, except for that nifty under-cabinet one you showed us! 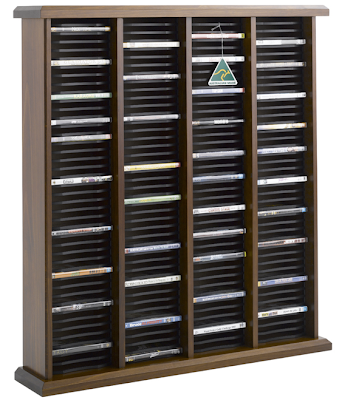 ), but they're probably great for ADD-style folks (as are the magnets) -- no drawers to conceal things. I doubt there's any one best way - your choice will partly depend on your kitchen and your sense of aesthetics. But let's address some of the questions raised by Claire - and by others who commented on the last post. 1. 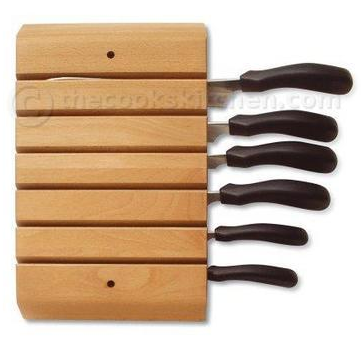 Does a knife block dull the knife blades? Here's what Jeffrey Elliot, executive chef for knife manufacturer Zwilling J.A. Henckels, had to say on the Real Simple web site. If you prefer a knife block, the slots should be horizontal so the knives slide in parallel to the counter rather than resting on the blade edges, which can dull over time. Of course, Zwilling J.A. 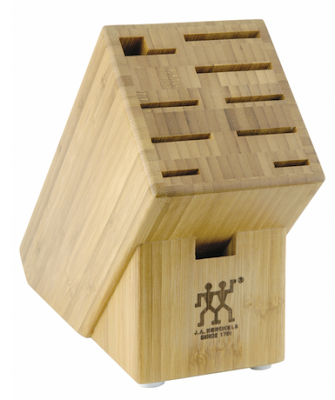 Henckels sells a number of knife blocks of the type Elliot recommends - including the one above, made from bamboo. 2. Is a knife block unsanitary? The only concern I'm reading about is that your normal wooden knife block cannot be cleaned on the inside - at least, not easily. If this bothers you, you'll want to pick another storage mechanism. 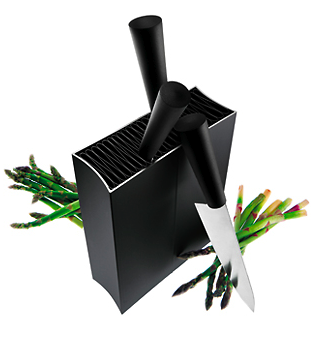 You could get the germ-eliminating knife block, I suppose - but it's hard for me to be enthusiastic about that one. 3. Isn't there a potential problem of buying a new knife and finding out it doesn't fit in your knife block? The Ekobo knife block and the Kapoosh knife block, mentioned in earlier posts, address this concern - but some folks aren't too happy with the Kapoosh. Another product that addresses this issue is the knife stand from Tools Design, created for Eva Solo, with both angled non-angled versions, and sold many places online. 4. What can you recommend for someone with ADD? Pare your knife collection down to the four or five that are sharp and that you use most frequently. 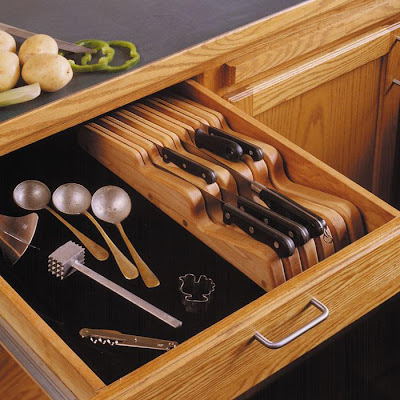 Do not then leave these fortunate and useful few to rattle around threatening bodily hard with every blind reach into the cutlery drawer; instead store them in a drawer knife block. I prefer drawer knife blocks because even with the extra step of opening the drawer, it takes less effort to slide a knife into a long slot open on the top than to stab it from the side into a tiny hole. 5. Any other knife storage ideas? Claire got me inspired to dig a bit more, and I found a few things that might be of interest. 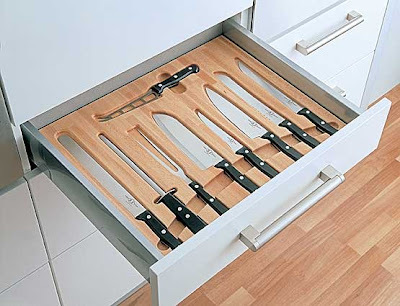 I wonder if the knife storage option shown above might help people who don't want to use a knife block or magnets. It still uses a drawer, but it's a drawer associated with a chopping block. Update on June 18, 2011: I'm no longer finding this product on the web, but MIU makes a similar product. 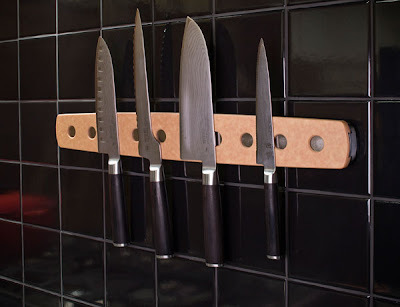 And here's a wall-mounted magnetized knife rack that doesn't have the blades exposed, lessening some concerns about safety and bad feng shui. Update on August 7, 2013: I'm no longer finding this knife rack. Finally, there are the built-in options, including a knife rack that can be built into the countertop. 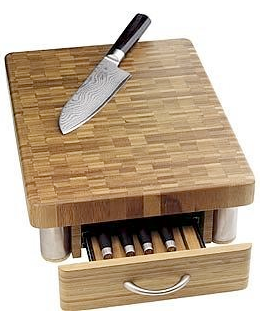 Or you could get a knife block pull-out cabinet. 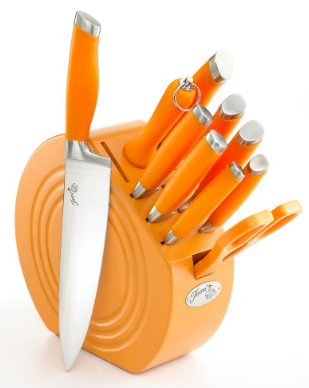 As I was researching my latest post on kitchen knife storage, I came across a number of other items that caught my eye. 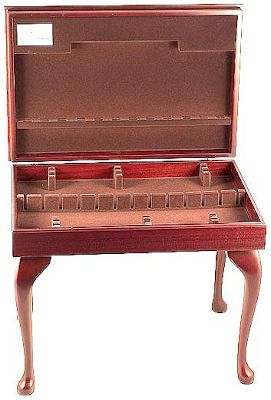 Here's one of them - a coffee table that doubles as a place to store your flatware. 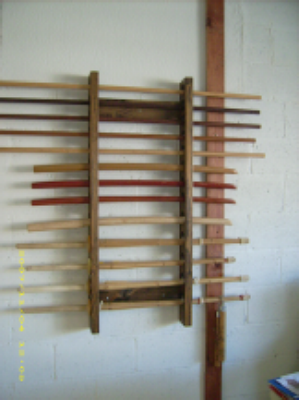 And it makes sense that someone would sell racks for the weapons used in martial arts - I had just never thought about it. These come from a "small, family-run business of martial artists who handcraft items for martial artists." The photo is somewhat blurry, but you get the idea. 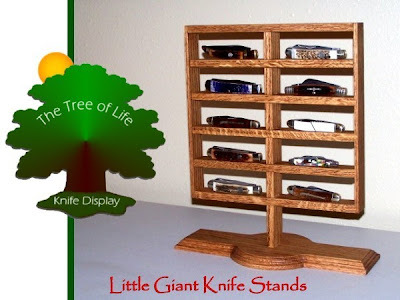 And if you collect pocket knives, there are knife stands for you to display them. 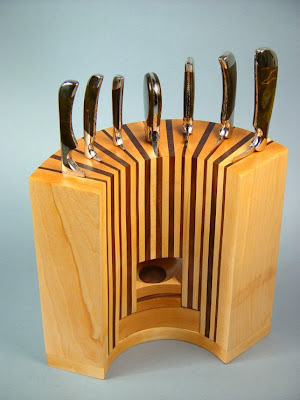 Another option would be a custom knife block from Jay Fisher. If you prefer a magnetic knife rack to a knife block, the Epicurean magnetic knife holder is a nice-looking option. And then there are the in-drawer options. Here is one common type of knife tray, from JK Adams. But sometimes you'll find this other kind of insert. Update on June 18, 2011: The site where I found this insert seem to have disappeared. 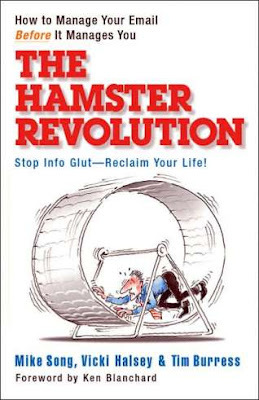 A man who's spending so much time on e-mail he's actually turned into a hamster turns to an info coach for help. That's the story line of this thin volume - and while it may sound too cutesy, the book is actually packed with good advice. And the hamster part isn't so overdone as to be annoying. 1. How much time we actually spend on e-mail, and why it's worth doing something about it. If your e-mail volume (sent and received) is 75 messages/workday, that comes to 18,000 messages per year, assuming 240 workdays/year. If it takes an average of 2 minutes to process each message, you're looking at 36,000 minutes/year - which equals 600 hours, or 75 workdays. If you could reduce that by even 20%, you'd save about 15 days - time you could spend on personal and business priorities. 2. How to reduce the volume of e-mail, and improve the e-mail you get. Volume reduction involves asking whether each message is necessary, appropriate, and targeted to the right people. It all boils down to this: Will getting this message actually benefit the recipient? The quality part involved both subject lines and the way the message is structured. Tom's post on the Rapid eLearning blog has a great e-mail before and after example, based on the principles taught in this book. The subject line changes from the meaningless "quick note" to "Action: Call those bozos at the circus to get the safety report." The body of the message is substantially improved, too - making it much easier to see what's needed. The book also includes a section on how you might coach the people who send you e-mail, so you can all improve - to everyone's benefit. 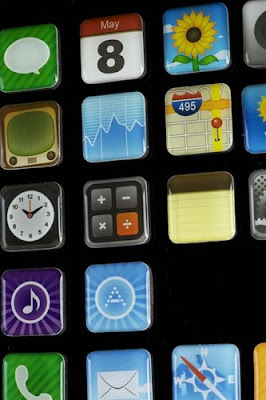 The book suggests a simple way to file your messages, with 4-5 top-level folders that the author says work for people in all lines of business. These seem to be for filing reference materials, not action-item related messages - so you might want to add to the list, if you don't want to use your inbox as a to-do list. I got the book at my local library, and it was a quick read. If you want something even quicker, that covers much of item 2 (excluding the coaching), read Merlin Mann's Writing sensible email messages. As long-time readers know, I'm a huge fan of giving things away on Freecycle, and this photo shows one reason why. Some recipients are kind enough to send along notes - or photos - letting you know how your items are being used. 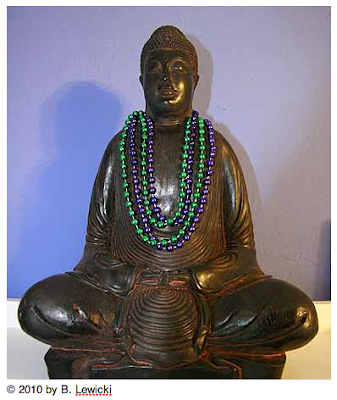 When I offered up some Mardi Gras beads that a client no longer wanted, I had no idea they'd wind up adorning a Buddha! My March 2010 newsletter is now available. Since this blog has a worldwide audience, I try to include products from as many places as I can. But I know that the majority of the products I list come from the USA or the U.K. - so here's a post focused specifically on products that my Australian readers can find more easily. 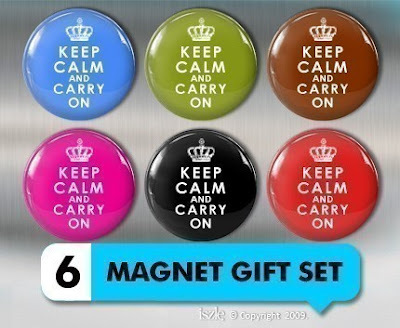 Intrigued by all the Keep Calm and Carry On products? You can get these magnets (and magnets with many other designs) from Iszle. 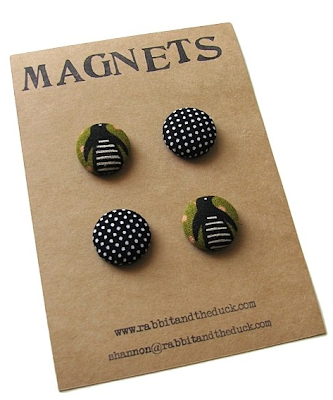 And The Rabbit and The Duck is one more place to get some magnets. 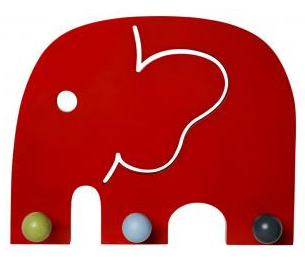 Update on Sept. 6, 2010: It seems this Etsy shop no longer sells magnets. Stepping up in size, we come to these lovely bookends, sold by Reader's Niche. They come in three different colors. 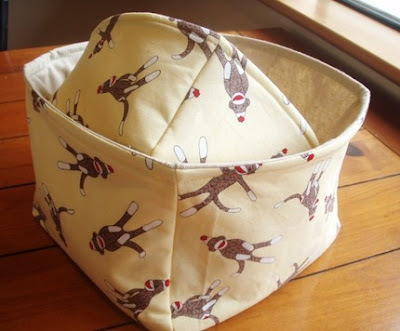 Sasha Sews has fabric baskets and other organising items. And moving on to larger items, Daire Timber Products provides "100% Australian made solid timber" CD and DVD racks of various sizes. It's a family-owned and operated business, too. 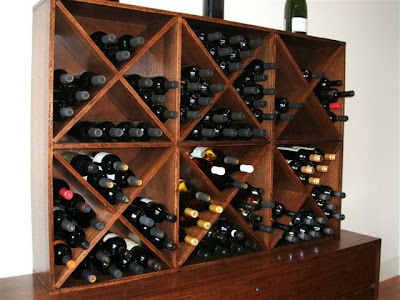 Wildwood Designs makes a range of furniture, including bookcases and related items, such as this wine rack. 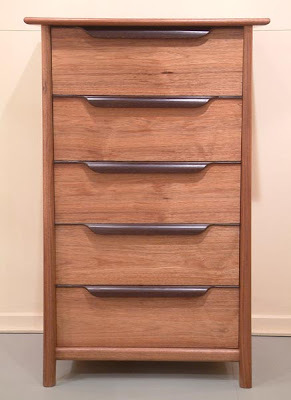 And finally, Bugendore Wood Works Gallery has some lovely cabinets from various furniture makers.